I colored the final drawing using watercolor paint on a separate sheet and combined the color and line art in Photoshop. 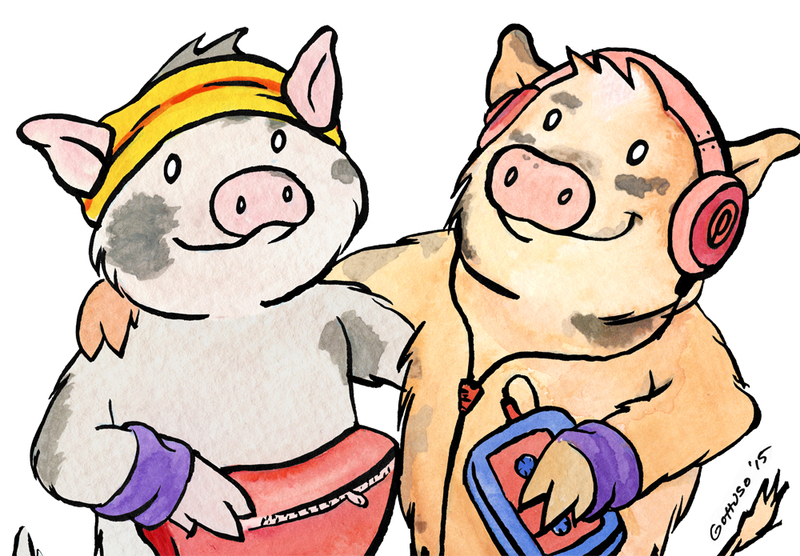 The pig on the left is colored after our first pig, Yoshi, and the pig on the right is colored after our second pig, Ponyo. Both have passed, so it was nice to remember them in this way. I wanted a suitably 80’s logo to match the theme, so after playing around with multiple ideas I settled upon a Back to the Future style logo. 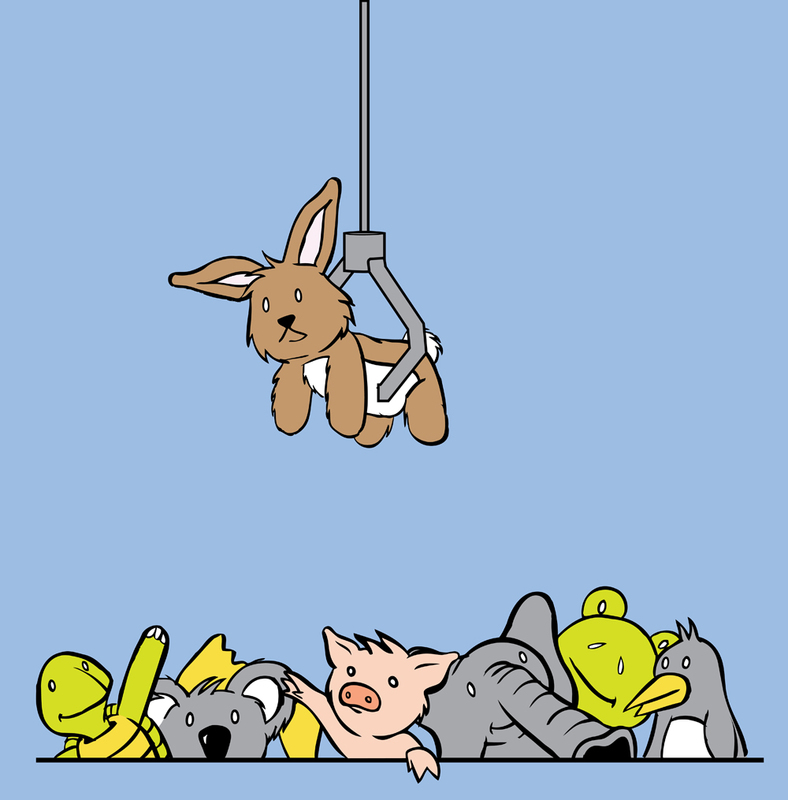 It is available to purchase on RedBubble. 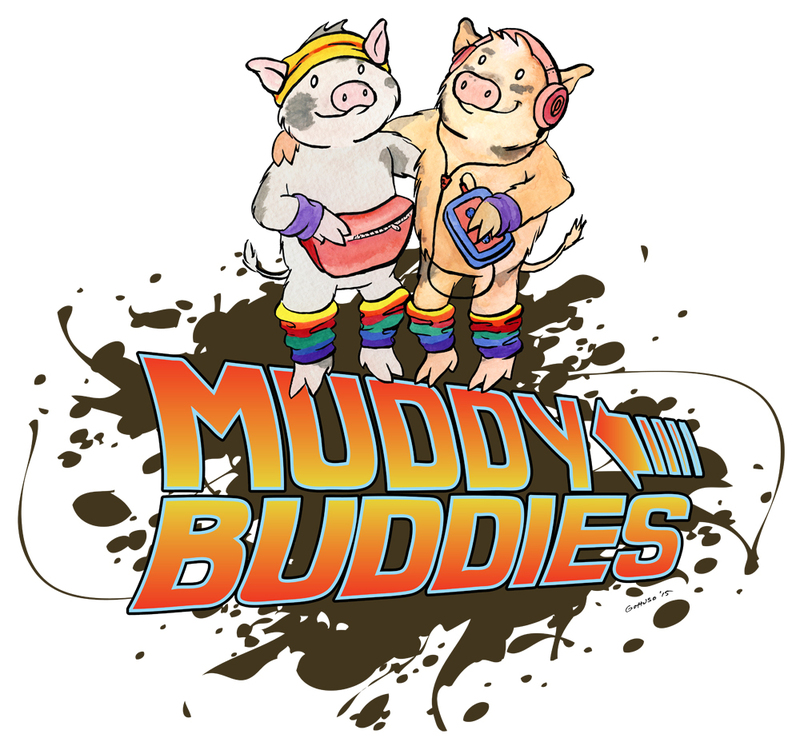 Click on the image for the full version of the T-Shirt artwork. This is the final digital artwork with a couple of tweaks and color edits. 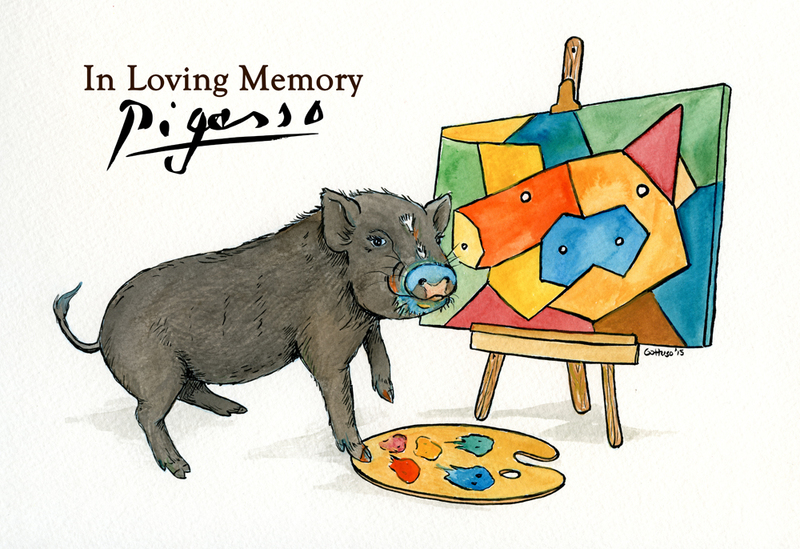 I ‘borrowed’ a copy of Picasso’s signature and altered it to read “Pigasso” as a final touch. I’m so sorry for your loss, Stephanie. I hope I could make a dark time a little brighter. I drew this for my friend Stephanie. She lost her beloved pet pig Pigasso very suddenly and unexpectedly. 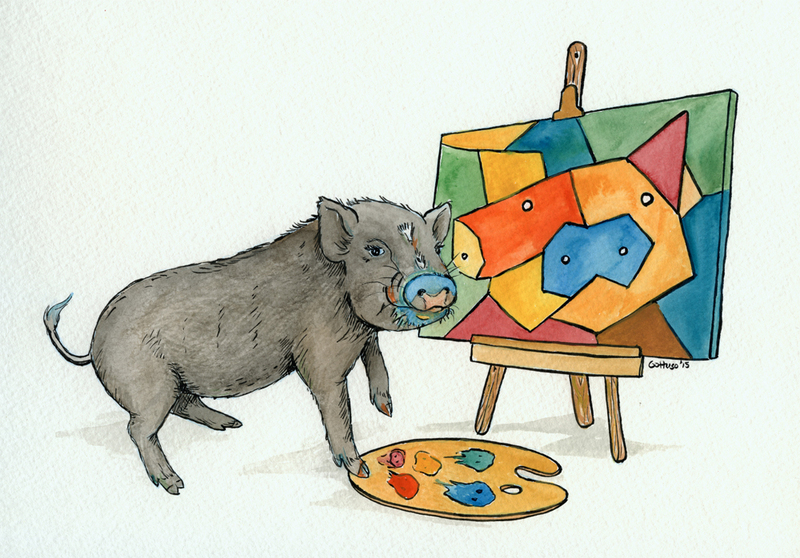 Pigasso was a very special painting pig who created artwork for Stephanie’s Snout Art. I wanted to do something for her, and art is a talent that Pigasso and I share. 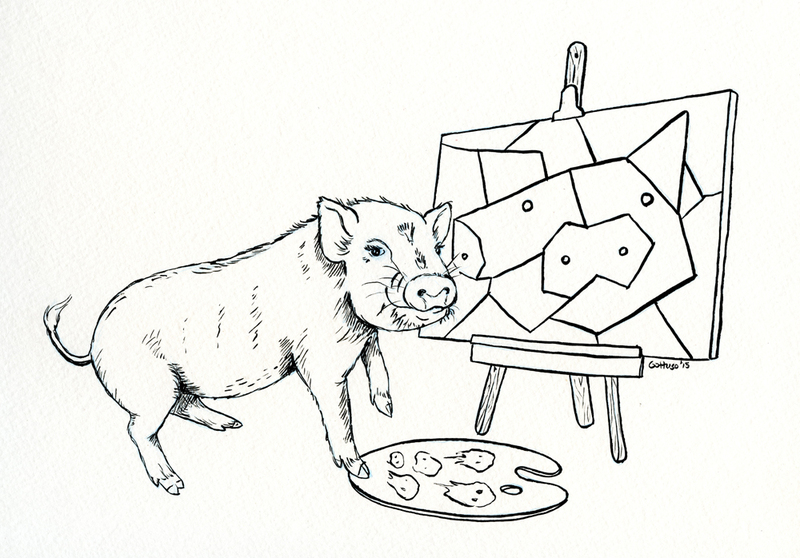 I studied reference photos of Pigasso, and I created a scene where Pigasso was painting in Picasso’s style. The line art is India Ink with a #3 Rosemary & Co. Kolinsky Sable brush, and the color is watercolor paint.